All of the code follows the video below. 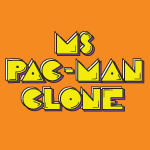 You can also download the whole Ms. Pac-Man Unity Project here. You can also Download all of my Unity game files so far for Pong, Space Invaders, Tetris and Mario.